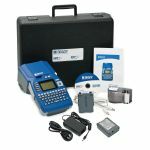 The BMP51 Label Maker has all the latest features for portable printing on the go: a large display screen- easy-to-use label design apps- fast print speed- and more. You can carry this printer throughout your facility to quickly and easily make labels on the go. It has a 300 dpi print head and prints at a speed of 1 inch per second. It can print on a variety of continuous and die-cut materials up to 1.5 inches wide. With a built-in cutter- easy top-loading cartridges- and 2 battery options and one is AC- the BMP51 Label Maker is a powerful printer for on-the-job label making. Large- graphical display with backlight that has on-screen indicators for parts- remaining material- battery and more! Ribbon and label materials in ONE cartridge!